One of the most powerful features of the HomeSeer product is the ability to write scripts to control the home automation environment. Since version 2.0, HomeSeer has been based upon the Microsoft .NET Framework. Scripts can (and should) now be developed using VB.NET instead of the vBasic scripting language. 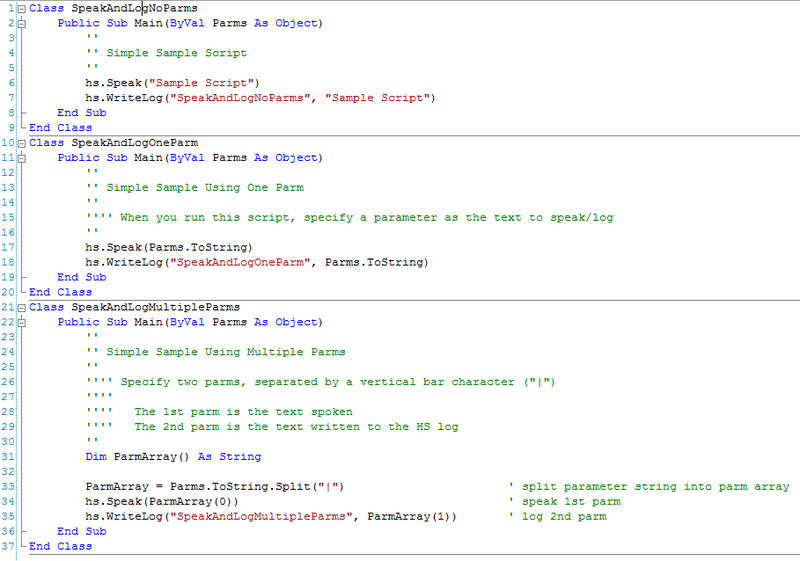 Note how easy it is to parse out the two individual parameters that were passed to the script. A typical HomeSeer script contains a single method that is executed when the script is invoked. The default method's name is Main. However, a single script can actually have many methods, each of which can be called from a HomeSeer Event. The Event specifies both the filename (.vb) and the entry point (usually Main), as well as any parameters to be passed to the method. 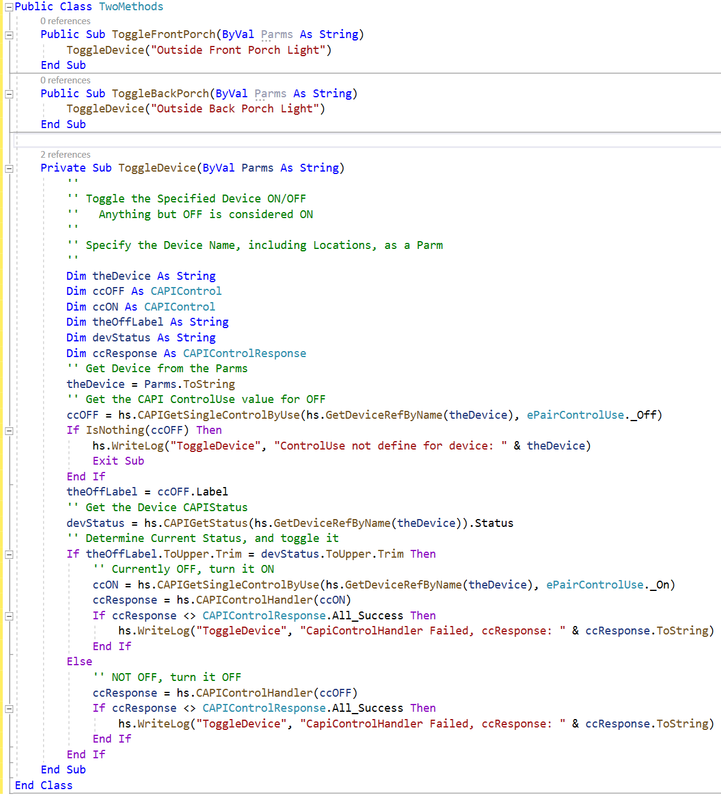 tenScripting is distributed with two files of sample scripts: SimpleSamples.vb and ComplexSamples.vb. You must add your scripts to the project to run and debug them. You can store all of your scripts in a single .vb file, or any number of .vb files. Do not add your scripts to the existing sample files. To add a new script file to the project, click on the menu item Project and then Add New Item. A dialog will open. Click on the icon for Class, change the Class name, and then click Add. A new .vb file has now been added to your project. You edit this file to add your script definitions. If you were to export all three of these scripts to the HomeSeer script folder, three separate files would be created: SpeakAndLogNoParms.vb, SpeakAndLogOneParm.vb, and SpeadkAndLogMultipleParms.vb. Note that each of these scripts are run with the default method of Main. While most scripts contain a single method, usually Main, scripts can contain multiple entry points: A single HomeSeer .vb file containing a single script, but with multiple SUBs defined. This would be defined as a single Class with multiple SUBs in tenScripting. In the tenScripting example below, a single script TwoMethods is defined with two callable methods: ToggleFrontPorch and ToggleBackPorch. Each of these methods uses the same Private method ToggleDevice. If two separate scripts were used instead of a single script with two methods, then the method ToggleDevice would have to be copied into each script.